So I have pretty well been on the pill since I was about 15/16. I have gone "all natural" on two occasions (prior to now of course). The first time, I hadn't been dating DH for long and I had managed to lose a lot of weight (through tons of exercise and a decent diet). Knowing that PCOS is metabolically related, I thought, this might be a good time to see what happens when I'm not on the pill and at a healthy BMI. Well, apparently, nothing. I waited 6 weeks and gave up and opened a fresh pack of BCPs. I enjoyed the consistency of BCPs too much during my college years to allow the possible surprise period to threaten my undergarments or my sanity... waiting for that period to come was just a nerve wrecking as waiting for the first one when I was 14. It was much easier to accept the status quo and resume my withdrawl bleeds. Another reason I had to see if I would have a period was that I had to know... was I still unable to ovulate? Infertile? You see, I knew DH was the "one" (and I hate that term) from early on and I needed to know if I still had to worry about this. I had to know for the future of my relationship with this great guy. At some point in our relationship, after things got really serious, I had to tell him, broken hearted, that if he wanted to have kids of his own someday that I couldn't promise him anything and it might never happen because of this problem I had. I don't know if what I had told him really registered but he stayed with me anyway. I felt I had to be honest about the situation. I couldn't live in denial. 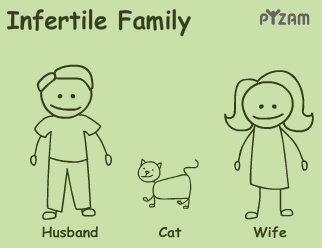 Infertility still seemed to be a challenge in my future and his if he stayed with me. Even though it was hard to tell him that, I can't imagine how I could have lived with myself not telling him. So after we got engaged we set a timeframe for starting to try to have children. Knowing my issue, we knew we wouldn't want to wait long, but realistically, I was still in grad school and we were going to be living in a crap-hole that we wouldn't want to raise a child in, and numerous other practical and financial issue led us to decided that me turning 25 would be the time to start. And as we approached my 25th birthday we were doing well as a couple and financially, but we hadn't met all the savings goals we wanted to before getting pregnant. But, still wanting to have a baby and honor our original agreement we decided to try... but not try. So I went off the pill again. That was December. And I have to say I didn't really know squat about my cycle at that point in time (not really that important on the pill). And when I had been off the pill for about a month and DARLING Husband wanted to go visit his parents for a week in January, I agreed thinking that it didn't really matter anymore cause ovulation should have already happened by then. I do have to say that I was in some doubt (although pretty sure) that I ovulated (having never done it before, you can understand my apperhension to believe that it had happened). I wasn't charting (not that I knew how). I just couldn't be sure. But 2 weeks later like clockwork, I got a period. So it took 9 weeks, but yes, I do believe that I had a real, legitmate period. Additionally, a study came out at the end of January (perfect timing) suggesting that taking folic acid for a full year before getting pregnant would reduce the risk of premature birth. Since I had only been on folic acid supplements since August, we decided to wait till August 2008 to officially start trying. So in August I went off the pill again and I did not get a performance like in January. I even sent my DH home for a week to see if I could invoke cruel, ironic ovulation again and no dice.